Sterifab is unlike any other product available in the US and world. 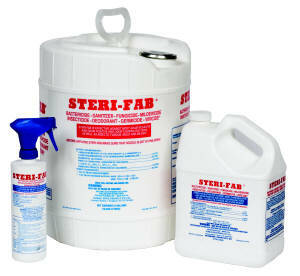 Sterifab kills bed bugs, fleas, ticks, as well as dust mites, bacteria, fungus, mold, mildew, viruses, and deodorizers. This powerful bacteriacide dries in 15-20 minutes and leaves no residue. No Dilution required. STERI-FAB requires no dilution, thus saving valuable time and effort. -and is is highly effective against roaches, dust mites, bedbugs, ants, silverfish, lice, louse eggs, fleas, ticks, sowbugs and other insects. - STERI-FAB even counteracts food, tobacco and other odors! Pricing shown is for 16 oz bottles. Would you like to see the Sterifab Bacteriacide MSDS sheet?